The funny thing about Black Swan is that I didn’t have a strong interest or desire to see it in theaters, especially since learning it would be in limited release. Then with it doing well in the specialized markets, the limit grew, grew once more, and now is in wide release… last I heard, unless my TV lies. Either way, I ended up in the theater this weekend watching this movie that’s getting praises left and right and will undoubtedly be thrown a few Oscar nominations, since it’s already nominated for the Globes. But just because it’s “Oscar bait” doesn’t mean everyone will enjoy it. This isn’t a movie for everyone, and I’m not saying that because it involves ballet dancers. If psychological thrillers aren’t your cup of tea, then stay away from this. 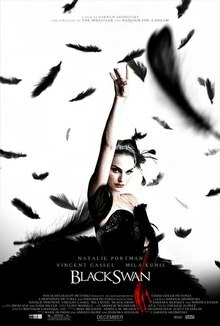 Black Swan is the epitome of the genre “psychological thriller” because the main character has some serious mental issues and it’s rather thrilling as an audience member to watch her. To sum up the story, the wonderful Natalie Portman plays a young dancer given the chance of a lifetime to play the lead role in Swan Lake. I’ve heard in other mediums as well as my dancer friends that getting such coveted roles are a dream come true. So not only is there pressure to not screw up the opportunity, you’ve got blood thirsty player haters that are eager to take the spot. Enter Mila Kunis, whom I think I’m in love with slightly more than Natalie, playing the newest dancer to the company that the director keeps comparing Portman to. I would say that’s when things get weird, but things started out weird since the first scene (which is a dream) and steadily grow worse as Portman has something like a mental breakdown Patrick Bateman would appreciate. One of the big talked about scenes is the lesbian scene between Kunis and Portman. It’s not really meant to be tantalizing, but almost how can it not be? And if you haven’t seen it, you may wonder how or why it is necessary, and yeah, it is important to the story. Portman’s character is so wound up that this scene is pretty much her climax (no pun intended). Oh yeah, the director has the hots for her and it’s one of the reasons why she got the part. Her mother is a former dancer and keeps her on a short leash, which does nothing but add to the crazy. So you’ve seen the trailers, so you know she starts to kinda look like a black swan of sorts. These can probably be the most disturbing scenes. Knowing the condition of her mental state, there are other things happening around her that make you wonder if what you’re seeing is just in her mind. The scene I’m actually referring to is Winona Ryder, who plays another broken character. She’s so damaged that… well… talk to me about it later so I don’t spoil anything. I might be sounding like I’m not too impressed with the movie, when the truth is I’m not Darren Aronofsky’s biggest fan. The movie is good, very well done, I just don’t think it’s amazingly awesome where I’d want to see it again or want to own it. I don’t wish to see Pi or Requiem for a Dream ever again and The Fountain and The Wrestler made me a little bored and depressed, although the story, acting and cinematography were really well done. The same goes for Black Swan. There are a lot of technical aspects of this film I liked. The painting of the characters, the story (which is an adaptation of Swan Lake itself) and of course the actors. Again, Natalie Portman was brilliant, and did a lot of her own dancing. Another fun thing I enjoyed was the use of mirrors. Just about every scene had one and I’ll bet there were a few tricks played within them. No doubt that was done on purpose. Fun fact: the stage scenes were filmed at my old college–SUNY Purchase. Overall, see it if you appreciate dance, a good thriller, Natalie Portman, suspense, mind-twisting story (which I do all of the above). Better yet, unless you are an Oscar voter or like to know what other films are up against, wait to see it at home.